I don’t know about you but sometimes I just have a craving for something tasty and I have to have it. 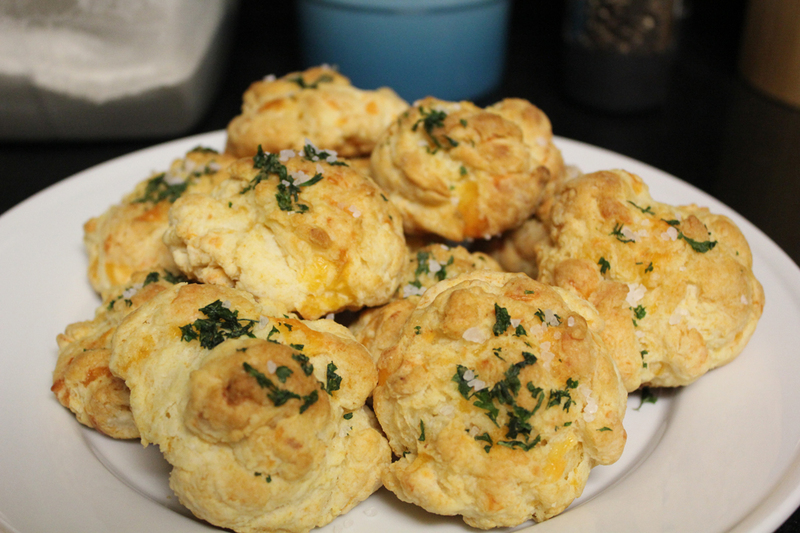 Recently one of those cravings was for those delicious cheddar bay biscuits at Red Lobster. I have to say, I’m not a huge Red Lobster fan, but I can eat those biscuits all night long! So, lucky for me, one of my favorite recipe blogs, The Girl Who Ate Everything, posted a recipe to try at home and of course I had to! If you decide to try these, they definitely taste best fresh from the oven. If you let them cool, just pop them in the microwave for a few seconds before serving (or enjoying, yourself!). Yummmm! Warm garlic-cheesy goodness! 1. Preheat your oven to 400 degrees. Lightly grease or line one cookie sheet with parchment; set aside. 2. Combine Bisquick with cold butter in a medium bowl using two forks (or a pastry cutter, if you have one). Don’t worry about mixing too thoroughly; there will be small chunks of butter in the mix, about the size of peas. Add shredded cheddar cheese, milk and garlic powder. Mix by hand until combined; don’t over mix. 3. Drop ~1/4 cup portions of the dough onto the lightly greased or parchment lined cookie sheet. Bake for 13-15 minutes in preheated oven until the tops of the biscuits begin to turn light brown. 4. While the biscuits are baking, melt butter is a small bowl in the microwave. Stir in garlic powder and dried parsley flakes. Use a brush to spread the garlic butter over the tops of all the biscuits. Sprinkle a little kosher salt on the freshly coated biscuits. Carbs? What Carbs? I’m making biscuits! These look delicious…I can almost smell them…mmmm.